Just bumped into Neil Powell from NUCA in town and he’s got the next set of drawings for the exhibition at the gallery here in Norwich. Two large tables are going to be created and some smart chairs have been found. The gallery will be divided in two, creating two large rooms where people will be able to take their time looking at Coracle publications. Larger works will be wall-mounted and we’re going to have more rare works in cases too. The space will mirror the gallery’s large ‘shop window’, which itself is split in two. Should look great. 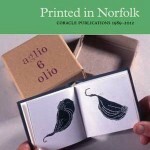 We’re currently proof reading the catalogue for Printed in Norfolk. Colin Sackett’s done a great job with the design and John Bevis’ piece ‘A Star-gazey Pie’ is a fascinating overview of the Coracle story.